Cesar Azpilicueta is hoping history repeats itself on Sunday as Chelsea go to Anfield to face Liverpool in a bid to dent the Reds’ Premier League title hopes. The Spain international was in the Blues’ starting line-up at Anfield back in 2014 with Liverpool looking set to claim the title, only for an unfortunate Steven Gerrard slip to be the catalyst to a 2-0 defeat for Brendan Rodgers’ side. Manchester City would then leapfrog Liverpool with just two games to go in the Premier League title race to become champions. What is largely forgotten, though, is how a makeshift Chelsea back four put in a superb defensive performance to keep out the likes of Luis Suarez and Raheem Sterling on Merseyside. And speaking after Chelsea’s1-0 win away at Slavia Prague in the Europa League, Azpilicueta recalled the match from five years ago and spoke about what it will take to beat Jurgen Klopp’s men this time around. “When we went there they had the party nearly ready because they were smashing every team in Anfield,” Azpilicueta said at the Eden Arena. “We arrived with a very clear idea and we played the game we had to do at that moment. “To beat that team, who were getting very good results, and to beat them 2-0 was a very important win for the club and for the fans. Everyone enjoyed that day and hopefully we can replicate it on Sunday. “It is not about frustrating Liverpool. It is about playing our game. We know they are fighting for the title, but for us, every point is vital to finish in the top four. This is an important game for us. “We know that we are playing against a strong side, but first of all, we need to keep the solidity that we have shown in the last games and defend very well as a team because they are a big threat. Then, if we take our chances, we can win the game. 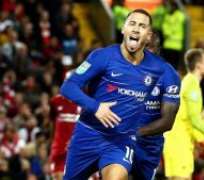 Chelsea have already beaten Liverpool at Anfield in the Carabao Cup this season, as a sensational late Eden Hazard goal proved the difference. That maintained the Blues’ recent unbeaten run at Anfield which stretches back to 2012 , but Azpilicueta is keen to warn his team-mates that his side have to prove themselves all over again. “Records are nice but we have to hold them,” he added. “Whatever you did in the past is nice because we have had very good results at Anfield, but we have to prove ourselves again on Sunday. Meanwhile, Chelsea were unconvincing in their 1-0 win over Slavia in the first leg of their Europa League quarter-final, and they will need to put in a stronger display on Sunday. Azpilicueta’s compatriot Marcos Alonso was the match winner on Thursday was his 17th goal in all competitions since joining Chelsea, making him the highest scoring Premier League defender in all competitions since his move. However, Alonso’s season has not gone to plan, with doubts over his performances and an increased battle with Emerson Palmieri for his starting spot. But Azpilicueta believes that Alonso needed his moment in the spotlight and has backed him to rediscover his best form. “We know his ability at scoring goals,” Azpilicueta continued. “He has scored very important goals for the club and against Slavia, it was very good timing, a good header. It is very important for him to score that goal.